Shirts With Random Triangles: Marvel to publish new Defenders series just in time for Netflix's version of the "non-team." 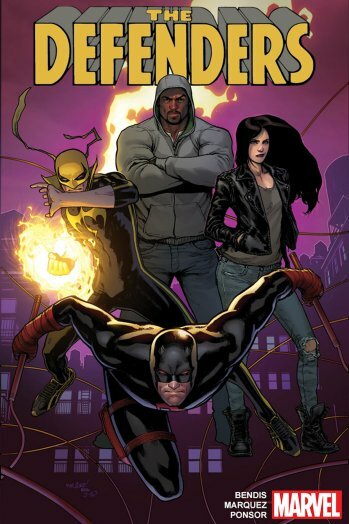 Marvel to publish new Defenders series just in time for Netflix's version of the "non-team." Image via Marvel/The Hollywood Reporter. Marvel hasn't featured The Defenders in its own comic book title since 2013. With Netflix set to team up Daredevil, Jessica Jones, Luke Cage, and Iron Fist in its forthcoming Defenders series, reviving the team in the Marvel Universe was bound to happen. Also bound to happen was the fact that the comic book series would a) Feature the Marvel heroes from the Netflix version, and b) Be written by Brian Michael Bendis, who has been associated with all four characters at some point over the past decade or so. Bendis created Jones for the Marvel MAX series Alias in 2001( the comic series was no relation to the JJ Abrams series that debuted two months before the comic series began). He wrote Daredevil from 2001-2006, and included Cage as part of a revamped Avengers lineup in The New Avengers. Iron Fist was also a made an Avenger later in Bendis' run. According to The Hollywood Reporter, Bendis will be joined by artist David Marquez. The two creators recently finished working together on the Marvel series Civil War II. The original Defenders first teamed up debut in Marvel Feature No. 1 (December, 1971), with a lineup featuring the Hulk, Doctor Strange, and Namor, the Sub-Mariner. Luke Cage and Daredevil both has several adventures of what was called at the time was called as a "non-team" who would come together when needed to fight the forces of evil.